The nation's second-oldest institution of higher learning is named after a hybrid king and queen, so it's only fitting that their new mascot is a hybrid of .. something. Part bird, part lion, all WTF? 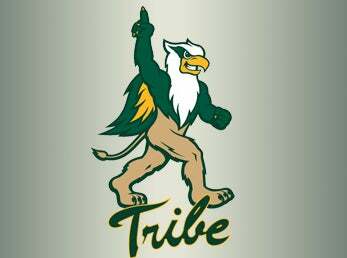 Actually, William and Mary's new mascot is a griffin, the mythical beast with the body of a lion and the head and wings of an eagle. The school president says it "speaks to our deep roots in American history," since most Americans learned about classical mythology from "Clash of the Titans." Of course, when that animal is anthropomorphized into a upright human in a bear suit, it adds a whole other level weirdness. This artist's rendering reveals some of the flaws in the concept. (Is he naked? Are those supposed to be ears?) The actual fuzzy costume works a little better, although the unnamed Griffin (Griffey?) is a little to proactive for my taste. Why is he so angry? And why is he looking into my soul? By the way, Bill and Mary's sports teams will still be known as the Tribe, which is only slightly confusing. Perhaps that's why some anonymous clown tried to justify this move by inserting an imaginary fact ("A group of Griffins is called a Tribe.") into the Wikipedia entry for Griffin yesterday. Mascot research committees may be pointless and expensive, but at least they are thorough.